Today I have the pleasure of showing you Herb Spiral with Michael Judd and some of the work he has done with herb spirals and to explain what an herb spiral is. Michael himself makes an appearance near the end of the video to give a tour of one of the herb spirals that he has built. Michael Judd is the hugely successful author of Edible Landscaping with a Permaculture Twist. He also runs Ecologiadesign.com where he does consulting and design work and can actually do an entire project from beginning to end, including installation. Michael also does several workshops, talks, and tours throughout the year. He has been featured on several podcasts including; The Urban Farm podcast, A Way to Garden podcast, The Real Dirt podcast, Sustainable World Radio podcast, Grow Edible podcast, and the Permaculture Podcast. Michael not only teaches others about permaculture, but he lives the permaculture life. I have been to his house a couple of times and he has permaculture all around. He has an Hugelkultur mound, which is wood buried by dirt. 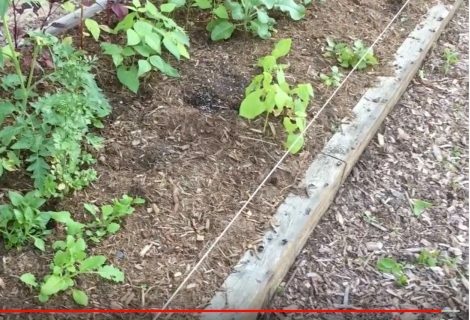 He has a food forest, bees, and even built and lives in a straw bale house. An herb spiral as explained by Michael Judd is like a snail shell coming out of the ground to create microclimates and provide lots of planting space in a small area. Herb spirals are beautiful but also allow you to stack plants horizontally AND vertically to maximize space. An herb spiral creates microclimates with regards to heat, moisture, sun and shade. At the top of an herb spiral the soil is drier than the soil at the bottom of the herb spiral. This is because the water seeps into the soil and naturally flows down because of gravity. There are areas that get morning sun only, other areas that get late day sun only and some areas that get all day sun. This variation allows you to put plants in specific areas of the spiral to meet their sun needs. This also applies to heat and coolness because of the amount of sun they receive. Herb spirals are generally made with large rocks or bricks. These large blocks absorb sun during the day and help keep the plants warm, extending the growing season. Michael Judd’s book, Edible Landscaping with a Permaculture Twist explains how to build an herb spiral. You can purchase his book on Amazon. Thanks for visiting the Herb Spiral with Michael Judd post. Please give us your feedback on Herb Spiral with Michael Judd by commenting below.